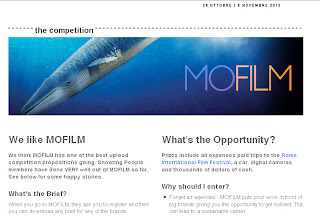 Independent filmmakers network Shooting People is currently supporting MOFILM’s Rome Film Festival competition. They’re looking for filmmakers to create engaging ads for one (or more) of 7 brands. These need not be dry or dull - the opposite in fact. They want to see creative and unique approaches to the briefs. For your efforts you have the chance of picking up a lot of goodies, including $82,000 worth of cash prizes, a car, a trip to one of two eco-tourism resorts in Australia and India, 5 Kodak Zi8 Digital Video Cameras, 5 Nokia technology packs and round trip airfare for you and a guest to Rome plus 3 nights accommodation. In addition to this, any Shooting People member that enters automatically goes into a draw to win a high-def Canon 5D Mark II camera, regardless of whether you’re a medalist in any of the competitions. Not a member? Fear not. Shooting People is offering free trial memberships during the competition. 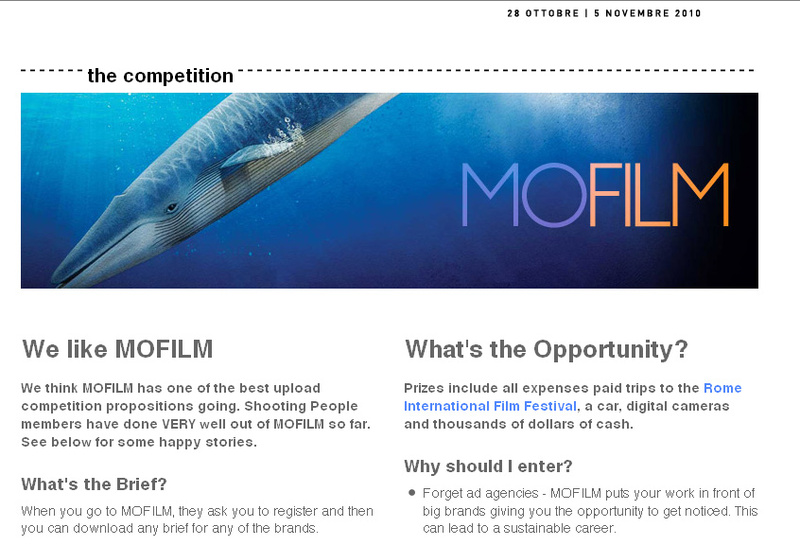 Just follow this url to claim it http://shootingpeople.org/mofilm/.